As a pet parent, taking care of four-legged friends is your number one priority—and keeping pets fed, watered, exercised and happy is just the beginning! 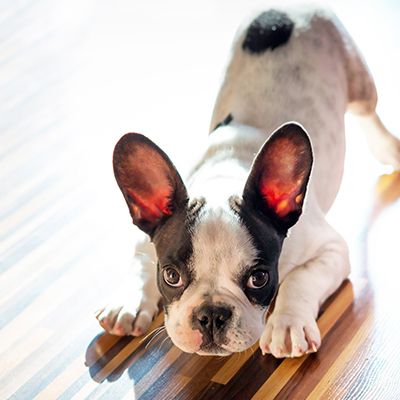 Pets need more than tail wags and tummy rubs to stay in tip-top shape. Here are the basic necessities for keeping furry friends fit and healthy for years to come. Feeding your pet a nutritionally-complete, balanced diet – and feeding him the appropriate portions of that diet – is one of the biggest keys to ensure a lifetime of good health. When choosing food, always read labels and steer clear of anything containing a lot of meat byproducts or ingredients that sound like a chemistry experiment. Don’t be afraid to try protein sources other than the “typical three” (chicken, beef and pork). Fish-based diets are healthy, deliver inflammation-fighting Omega-3s and have a smaller impact on the planet. Remember: cats are natural carnivores and only cat food meets their nutritional needs—so no sharing food with the dog! Experiment with natural treats such as fresh veggies like carrots and celery. For a special treat, share an egg, chickpeas or plain yogurt to pack a punch of valuable vitamins into snack time. When it comes to chew treats, NEVER give a dog a bone – the fragments can splinter when chewed and cause serious damage to your dog’s intestines. Opt instead for tough rubber toys or Himalayan yak milk dog chews, and always supervise your pet while he’s chewing. Not only does regular exercise make for a strong, healthy pet, but it also helps prevent obesity – one of the most devastating preventable conditions. Your vet can recommend a specific exercise regimen based on your individual pet’s age, breed and health. Being active keeps hearts healthy, aids in digestion and helps build confidence and curb bad behaviors. Boost brain function with mental gymnastics like puzzle toys, hunting for dinner or treats and obedience training (yes, even cats can be trained!). Keeping your furry friend’s synapses firing will ward off age-related cognitive decline and keep your pet sharp well into his golden years. When you bring a new pet home, one of the first things you need to do is to make his first vet appointment. There, your vet will counsel you on the cornerstones of responsible pet ownership: spay/neuter, vaccines, microchipping and parasite prevention. Altering your pet protects against infections and certain types of cancer. Vaccinations are important for giving your four-legged friend a foundation of good health. Microchipping provides a permanent method of identification in case your pet ever gets lost. Parasite prevention like flea and tick preventatives and heartworm prevention pills help keep your pet healthy, protected from disease and itch-free! 5 Don’t forget about dental health! Protecting pets’ pearly whites means more than banishing bad breath. Dental disease doesn’t just affect the mouth; kidney, heart and liver disease have all been linked to bacteria entering the bloodstream from a dental infection. It’s estimated that by the age of 3 years, 70 to 80 percent of pets already show signs of periodontal disease, so it’s important to commit to a dental health regimen early. Brush your pet’s teeth once a day, and use dental treats, oral rinses and plaque-prevention gels to keep pearly whites well. Preventing periodontal disease can add two to five years to your pet’s life!